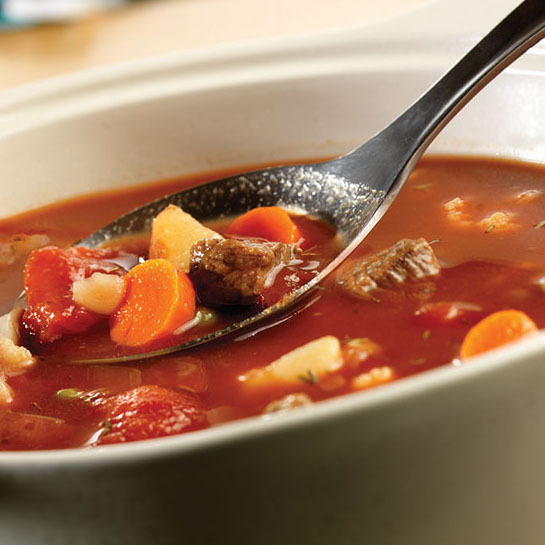 A perfect winter warm up – this savoury vegetable beef soup is the ultimate comforting dish for when you need a pick me up. First, simply place the potatoes and pour the broth into a 4.5l non-stick saucepan and bring to the boil on a medium to high heat. Next, turn down the heat to low, cover and cook for 5 minutes. Stir in the beef, V8 Original Juice, canned tomatoes, mixed vegetables, thyme and ground black pepper. Cover for 15 minutes and cook until the vegetables are cooked through.